Aikido is fun! It is a form of personal development with the excitement of martial confrontation, the skill of a refined art, and the satisfaction of good exercise. Aikido involves blending with and redirecting the aggressor's movement (instead of directly opposing with force) to restrain or evade without needing to inflict injury. Aikido is non-competitive (and retains techniques that would not be safe for competitions), the idea is to refine one's self rather than conflict with others. 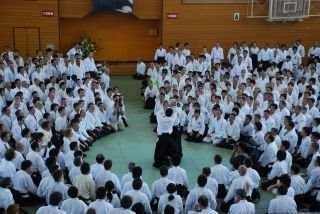 "Aikido" can be translated as "harmonising discipline". A typical class warms up first with stretching, the time is then punctuated with demonstrations of specific techniques by the instructor, and the bulk is spent practising those techniques in pairs (or small groups). Students take turns to attack or to respond to being attacked, and frequently change partners (so that everyone can train with the more advanced students and with people of different builds). Sometimes training involves weapons (e.g., sword, staff and knife) or multiple attackers. Aiki-Kai Australia is the local mainstream aikido organisation; we are recognised by the Aikikai Foundation in Japan (headed by the heir of the founder of aikido) and member of the IAF (which organises international events). The technical instruction is overseen through the foundation of Sugano shihan (who introduced aikido to Australia at the direction of the founder of aikido). It has dojos in every state of Australia and organises week-long national training camps every six months (so that students can learn from more senior instructors than their local areas possess). Main dojo, learn directly from Hanan Janiv 7th dan shihan. Scout hall, Tooms Pl, Lyons. Wednesday, 7:30-9pm. Possibly also Friday or Monday, contact for details. ANU SRA dojo (The Australian National University). Tuesday 7:30-8:30pm and Sunday 5:00-6:30pm. Beginners may commence anytime. The simplest option is just to enroll (for a semester) in our ANU dojo beginners' course, at which no special clothing or equipment is expected. Comitted students instead join the national organisation, pay monthly, then (to train in both locations) join ANU Aiki-Kai club and become Sports Union associates (or be ANU students). The total cost per training session works out about the same as taking public transport. For more specifics, try contacting people via aikido.org.au or the facebook group.